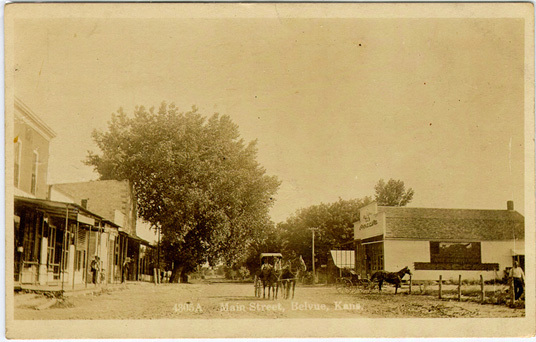 These are some old photos of Belvue Kansas. They are in no particular order. These pictures were provided by LeRoy Brunkow. First Post Office in Belvue Kansas. Est. May 3, 1871. Located southeast corner of Hwy 24 and Broadway. At that time it has 2 RR. Date of photo unknown. The Postmaster at the time was George Meens. Public School in Belvue Kansas. Built in 1916. Was located southeast of Hwy 24 and Anderson St. Unknown when picture was taken. No longer standing, lost to fire. of Broadway south of tracks. Filling station north side of Hwy 24 Belvue,KS. 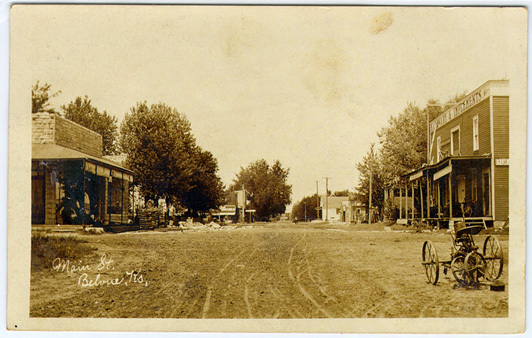 Mailed date on post card is July 1928.
and Main(Broadway)north of railroad tracks. corner of Hwy 24 and Broadway, July 1956. Belvue Kansas watertower being replaced. The old one in the foreground (grey) new one in front. Picture taken 1991. Picuture looking north at Hwy 24 and Broadway. Dated Aug. 1908. Picture looking north on Hwy 24 and Broadway. Dated May 1911.